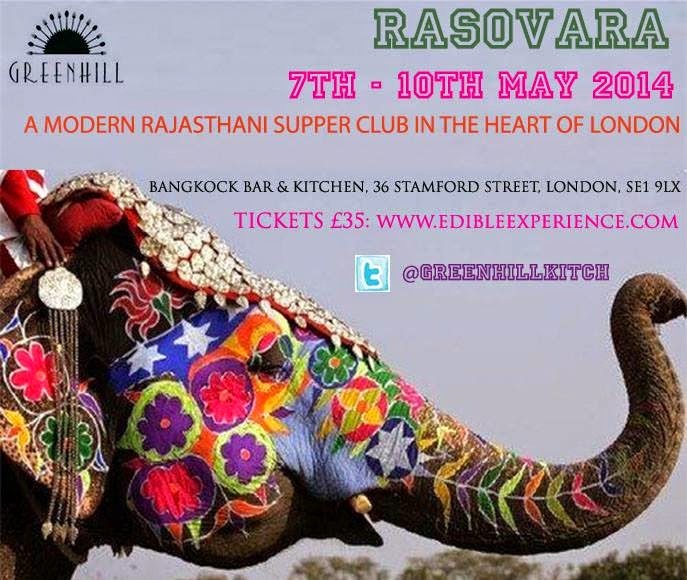 Over 4 days in early May, from Weds 7th to Fri 9th, Greenhill Kitchen will be cooking a series of Rasovara or 'Royal Kitchen' supper clubs at Bangkok Bar & Kitchen in Stamford Street, near to Waterloo. Tickets are just £35 each - get ready for some unbelievable flavours! "After success of running innovative pop-up kitchens in Mumbai, Flora Hilleary and Aditi Dugar will be scenting the streets of London with their spices for a special Rajasthani supper club. Rasovara means 'royal kitchen' in the local language, and the concept for this supper club was formed from the creative duo's love of the food that is local to India’s largest state, Rajasthan. With the arid Thar dessert to the West and luscious fertile fields to the East, Rajasthan offers an amazing medley of dishes steeped in history and comprising of fascinating ingredients. Aditi’s family is from Rajasthan, and like all true Rajasthani’s, are gourmands through and through. Flora has spent much time in the larger cities of Jaipur, Jodhpur and Udaipur, training chefs in the top hotels. Rasovara will be original and promises to offer vegetarian and meat Indian food like you have never tasted before in London. With the freshest spices brought in by hand from India and local British ingredients that will have you yearning for more. This pop-up dinner will take you on a journey to historic India and back."